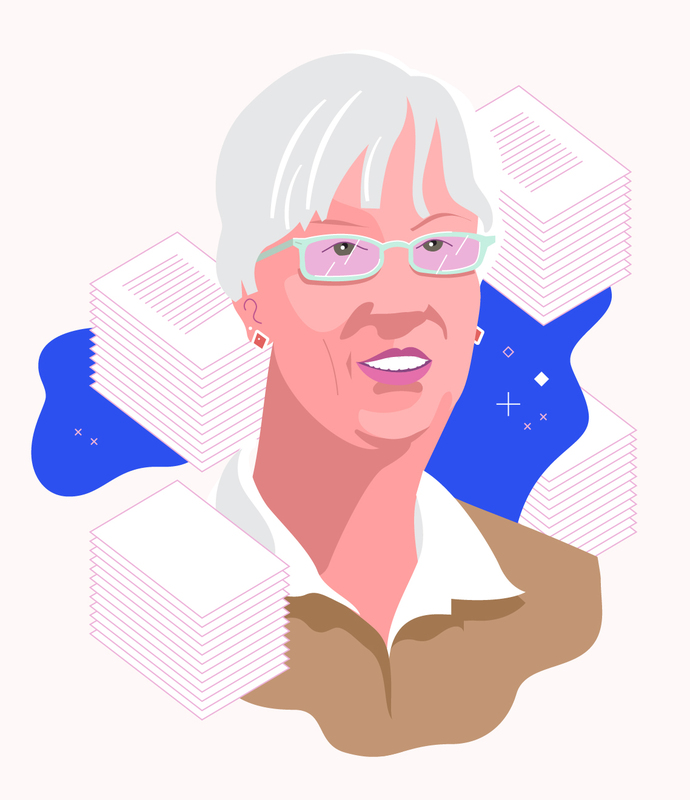 Jean Deken was hired at SLAC National Accelerator Laboratory for a daunting task—to chronicle the history and culture of the decades-old lab and its reseachers as the fast pace of its science continued. She became SLAC’s archivist on April 15, 1996. Deken is retiring after more than 20 years at the lab. In this Q&A, she discusses big changes in physics, the challenges that archivists face, and her most surprising finds. What was it like when you first arrived at the lab? At the time, I remember feeling overwhelmed because the archives were unstaffed for more than a year. When I arrived, I couldn’t fully open the door to my office because there were so many boxes that had been stacked there. Gradually, I unearthed the desk, chair, computer and phone. BaBar was ramping up, which was the big experiment at the time that was exploring antimatter, the interactions of quarks and leptons, and new physics. The physicists wanted to know what do with their records, because they knew they were making history. The Superconducting Super Collider in Texas had recently been canceled, and the contents of their library were distributed to other labs. SLAC received pallets and pallets of microfilmed physics journals. I worked with the library to figure out what to do with all of them. There was a pent-up need to get information into the archives. Because I was so busy, I sometimes didn’t have time to eat until the evenings. How did you first get involved with archiving science? I was looking for a part-time job between undergraduate and graduate school, and I began working at the Missouri Botanical Garden as a cataloguing assistant. There was a stack of stuff in the corner of the cataloguing department that no one wanted to go near. I started digging into it and found manuscripts from the early days of the botanical garden by the founder and his scientific advisor. So I acquired some archival procedure manuals and started working on arranging these papers. Soon, I began fielding all the questions the library got about the history of the garden. How did you make your way to SLAC? For many years, I worked at the National Archives in St. Louis, Missouri. While I was there, the Archives decided to celebrate the 50th anniversary of World War II in a really big way. In St. Louis we made a traveling exhibit that focused on war efforts of civilian and military personnel. I took the lead on looking into the civilian war effort, which included Women Air Service Pilots (WASPs) and scientists working in research and development, including those whose work contributed to the Manhattan Project. Working on the exhibit, I became increasingly aware of the importance of preserving scientific perspectives as we uncovered stories hidden in personnel records. I thought, “Why did I never hear about this before?” It’s partly because the records of these efforts were scattered. That got me interested in learning more about archiving the records of government science. At the same time, contemporary records were going electronic, in a big way. I remember thinking, “This changes everything.” I decided that the best solution for an archivist would be to be as close as possible to the records as they’re being created, to be embedded in an organization while working on how to preserve this information. Wanting to be an embedded archivist, and wanting to work with the records of government science, I applied for the archivist job at SLAC, and they offered it to me the day of my interview. What does it mean to process an archival collection, exactly? For paper collections, you process the documents to try and maintain the original order. The contextual information gives insight into the personality and intellect of the records’ creator. But there’s often disorder in storage and therefore in reconstructing the original order. The first stage is to create an inventory of every box and folder and tag each item to see connections with institutions and topics. This is how to make sure the contents are roughly chronological and sorted by topic. Next I would make sure the documents were stored in acid-free boxes and file folders. At this point, I would also look for contaminants, such as acidic paper, insects, old tape and rusty staples. For these damaged items, I would sometimes simply remove the contaminants, and other times [for more damaged items] photocopy the documents on acid-free paper and store the original in a protective sleeve. In one collection, I found an envelope full of cash. I went back to the scientist and said, “I’ve never gotten a tip before.” He had been collecting meal money for a conference and had lost track of the envelope. After this physical work is done, I would create an electronic guide to the contents. We have also digitized some of the hardcopy archival materials when requested, and those copies are kept in a digital repository. We have just begun to dip our toes into archiving the lab’s digital materials, starting with photographs. The type of digital storage we are using is really an interim fix. Speaking of the discipline, what are some of the challenges archivists face? I’ve been concerned about electronic records for decades now. The problem with digital records is that no one’s figured out how to make them last. This is still true, and it’s something archival science needs to address as a field. There are quite a few questions we’re asking ourselves: What data and records are worth preserving? How long should they be saved? Who will save them? And who gets access? One of my own future efforts in the field—I’ll keep busy during retirement—has to do with data archiving. With data, there’s such a vast amount of information, and each scientific discipline has different protocols. At international and national labs such as SLAC, many of the scientists come from elsewhere, and there are various agreements and regulations about responsibilities towards data and records. I’m working on proposing policies for these varied situations using SLAC datasets as a test case. Was it challenging to learn enough about the science to preserve it well? During the interview for the job, I asked, “You know I don’t have a physics background, why are you interested in me?” The interviewers told me, “We can teach you the physics that you need to know, and we also consider it part of our job to be able to explain physics.” But they told me they needed me to figure out the government regulations that relate to archives. When I started, I bought children’s books about physics, listened and asked a lot questions. What have you learned about scientists themselves? It surprised me that these absolutely brilliant scientists were actually down-to-earth and approachable. The experimentalists, for example, would test you to make sure you knew your stuff, but then they considered you a member of their team. The researchers are used to multidisciplinary teams and needed to know that you could pull your own weight. I was also accustomed to a corporate government setting, and the environment at the lab was totally different. At first, I could not dress down enough to fit in. It was a funny, unexpected cultural shift. How has the lab changed, from your perspective? The place has changed completely. When I started, SLAC was a single-purpose lab—focusing on high-energy physics. Later, it became a multipurpose laboratory and expanded into many other research areas. In the 1990s, SLAC was mature in the field of high-energy physics. The leaders of the lab had a sense that we had a history that needed to be preserved. What are some of the projects you’re most proud of? During my interview, several people mentioned SLAC’s involvement with the early web. SLAC has the oldest web pages still in existence. Even though Tim Berners-Lee at CERN created the first website, the original code wasn’t preserved. It has to do with a quirk of HTML—when you overwrite the code, it disappears. At SLAC, Louise Addis and Joan Winters had the foresight to understand this from almost the beginning, and they saved the original HTML pages from the first North American website. So, I was able to deposit those pages into the Stanford Web Archives when it was established a few years ago. I was also a co-author of [SLAC Founding Director] Pief Panofsky’s memoir, which I edited. I like to tell people that his first language wasn’t German; it was physics. I really had to pull the story out of him to get the full flavor of what he wanted to say, but it was a lot of fun. Overall, I’m really proud of the SLAC archives. It’s a robust and well-respected program with minimal resources. And it’s been a whole lot of fun. There’s nothing I’d rather have done.